The trees in the back yard of our Queensland home are particularly noisy at this time of year. 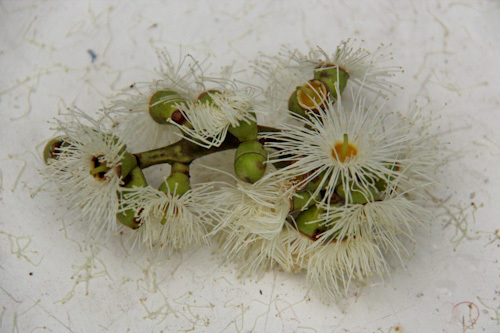 The Cadaghi gums (Corymbia torelliana) are in flower, and all the creatures want to join in the party! 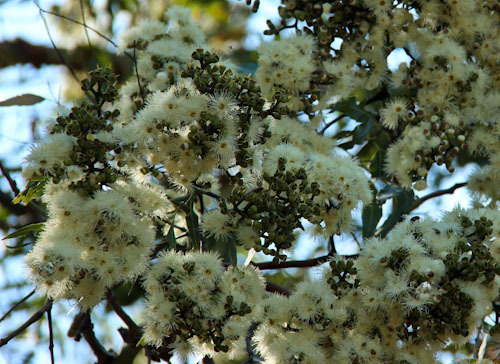 Our Cadaghi gums are in blossom at the moment. The pale blossoms fill the air with scent and attract birds, bats and possums. 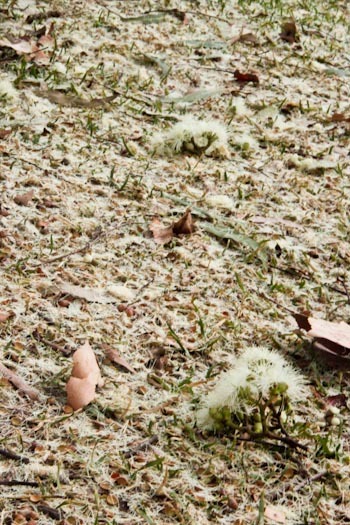 The ground beneath the gum trees is almost white from all the fallen blossom panicles. 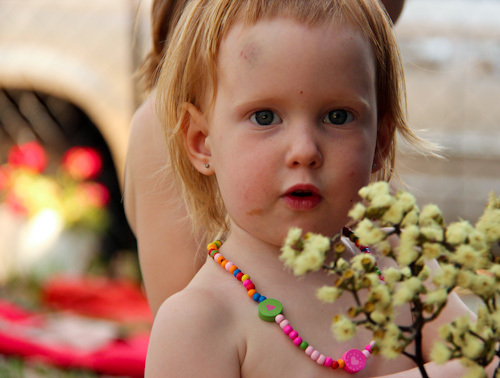 A fine layer of blossoms covers everything under the trees, including The Gifted Gypsy. 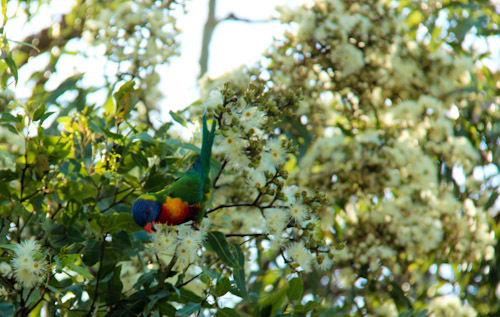 The parrots — like this rainbow lorikeet — love the nectar and squabble as they browse the tops of the branches. 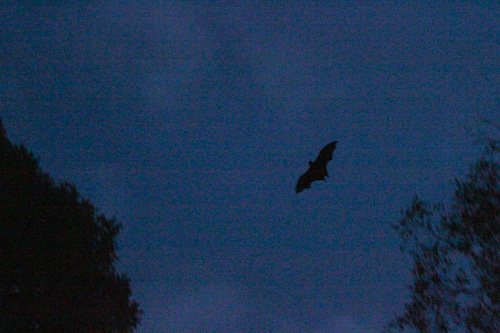 At night, the bats are even noisier than the birds as they fight off the possums. The animals aren't the only ones interested in the blossoms. 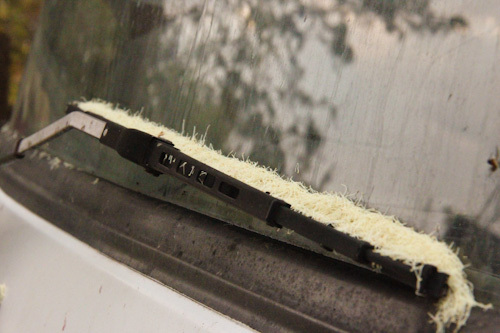 Our girls like to crumble them apart and play with the texture between their fingertips. In the manner of most of her current games, Delaney personifies the blossom clusters into families and directs them to talk to each other. So cute! Cadaghi gums are considered a weed in this location because they grow so well away from their native rainforest habitat. Although they make a mess, it’s nice having mature trees in the back yard, and I love the wildlife they attract to our our space! Your gum trees are so pretty! I love the flowers on them! We have gumball trees in the American South… not nearly so nice! Gumball trees have pretty star-shaped leaves, and nasty, spiky gumballs about the size of, well, a gumball. Each mature tree produces approximately 200 gazillion gumballs, and scatters them all over the yard in the fall for bare feet to step on the following spring and summer. NOT fun! I much prefer your kind of gum tree! I second…what did Dee get into to have those bilateral bruises on her forehead and under her left eye looking swollen? Poor kiddo!! Dell came off as second-best in a scrap with her sister, but she’s tough and forgiving! Are those bats nectar-eating bats? Very neat picture of the bat, by the way.